I can’t promise that the episode will be done by next week, But since its been a while since the last post, I thought I’d give whatever update I can. So, here it is. The evening twilight casts an eerie calm through the partially clouded sky, into the heart of the dense jungle. The calm is broken as a blue streak cuts a path between the trees at high speed. Sonic the Hedgehog pants heavily as the forest rushes by him. He glances back over his shoulder as he runs. Seeing nothing, he wipes the sweat from his brow, and keeps on running. But something catches his eye. To his right, intermittently hidden by the trees rushing by, another figure rushes through the shadows, keeping perfect pace with Sonic. The trees momentarily clear, long enough to reveal the figure of Shadow the Hedgehog, his eyes locked firmly on Sonic. “Shoot!” Trying to lose the pursuer, Sonic picks up the pace. With a growl, Shadow speeds up to match. In a flash of blue, Shadow suddenly appears in his path. “Whoa! How did he–! ?” Acting fast, Sonic leaps from the ground, flipping through the air to collide feet-first with a wide tree trunk, and kicks back off, shooting in a new direction that takes him away from Shadow. He lands on the ground and keeps on running. Sonic looks off to his right, where his target, the glowing light, now waits. Not allowing himself to get too far from it, Sonic makes another leap, intending to get back on course. But this time, Shadow appears in the air directly above him, striking down with a hard kick that knocks Sonic straight to the ground. What’s this!? Shadow attacking Sonic!? Just what kind of episode is this!? Find out next time, on The Chaos Project 50th Episode Special! Well, at this point, listing the exact changes made from the original Shadow the Hedgehog would be a bit…arbitrary. It was…all change. Sure there were some old quotes used under new contexts, and of course Gerald’s message still played, but that’s about the extent of the similarities. I suppose, right now, the most important thing I ought to talk about is the reason this story exists in the first place, now that the surprise twist is out there in the open. Sonic Boom. Why? Well, anyone who’s watched the full show might have been a little bit confused by one element of the epilogue. Shadow’s castle. You might be thinking, “Didn’t Shadow live in a cave or something?” The cave was just a clever hiding spot he chose for the Eggmen during his plot to destroy the universe in “Eggman the Video Game,” the series finale (and a pretty dang good finale it was). Other than that finale, Shadow’s only appearance in the show was the finale of the previous season, “It Takes a Village to Defeat a Hedgehog,” which you’ve just read a partial novelization of. So throughout the show, no actual indications were given as to where or how he lives. So then you might be wondering, “Where did the castle come from?” Well, personally, I’ll have to admit that I’ve only had the…”pleasure” of playing Sonic Boom: Rise of Lyric. Even though I’ve come to the understanding that the two handheld installments are superior in more ways than one, not the least of which is that they’re actually canon to the show while Rise of Lyric isn’t, I’ve never actually played either of them. But a few years back, not long after the launch of Fire and Ice, something was brought to my attention. Please, take a look for yourself. See that symbol on the left? Look familiar? Here let me show you something else. To my knowledge, Shadow the Hedgehog doesn’t even appear in Fire and Ice. But his presence is unmistakable. The top image shown above depicts the “Gothic Gardens” zone of that game. And that banner, bearing Shadow’s personal insignia hung upside-down, is not just hidden in some obscure place as some sort of cheeky reference. No. It’s plastered in plain sight over and over again throughout the level. If you’ve seen it before, it’s practically impossible to miss. That kind of thing doesn’t happen on accident. So the moment I first saw it, it got the wheels turning. In-universe, why could that possibly be there? That emblem has appeared only one time. In the heart of the Black Comet. At first, I contemplated the possibility that Sonic Boom was actually a post-apocalyptic world where the Black Arms had taken over all but a few isolated pockets of the world. But you gotta figure you’d see more evidence than this if that were true. So then, the Black Arms must have been defeated. But then, what would these banners be doing here? They obviously weren’t made by the aliens themselves, it’s not in their typical organic style. They would have to have been put up by someone, someone who knew what they meant, as if in the aliens’ honor. Perhaps, someone who is evil in this universe when they normally wouldn’t be, with an inherent connection to them already there. From there on out, the story practically wrote itself, explaining each and every difference between the main timeline and Boom, and how it could all be drawn back to the war with the Black Arms. In the Shadow of Time was born. So…what else is there to say? Everything, and I mean everything about this story was built to achieve this eventual goal. It wasn’t originally planned as an April Fools joke, I very much meant it all seriously. If you want to believe this story, then you should never look at Boom the same way again. I only really started writing this story because I wanted a distraction to get past my writer’s block on The Chaos Project, and once that was done and I was back on track, this story fell by the wayside. April Fools was just a fun excuse to tie up loose ends. “You probably think…that I’ve become the greatest evil you’ve ever faced…don’t you?” The time for the final battle has come. A hero’s name is in ruin. It’s every Hedgehog for himself, Devil Doom take the hindmost. Everything must end in one great Boom. Well…I’m running into the usual problem here of not being sure what to write about an episode that was started a very long time ago. I’ve touched on this a bit already, but I started this episode on December 20th, more than three months ago, three days before the actual anniversary. About a page in, I decided that writing the entire episode in three days would be unreasonable, and that Condition Extreme would be much better placed at that time, so I took a pause on this one and started writing that one instead. So by now, you might be wondering…what was the point of this episode? Why make a Sonic Adventure episode focused on Rouge of all people? Well…I did fudge it a bit. In early planning phases of The Chaos Project, having a fake Big that infiltrates the Rebellion was one of my very first ideas (even before Heavy Magician existed). I wasn’t thinking much about that old idea, until I decided for certain that I was going to do Rouge’s arc for this Season, and I realized that I could work the two stories together. Everything about this episode that involved Rouge, Sly, and Big, were all planned at this point. But at that point, I figured it would be more like a “meanwhile, with Rouge” type of thing, while a different episode was happening with our normal characters. But I was never really sure what kind of episode I could fit that into. Eventually, the looming date of the Adventure 20th anniversary was brought to my attention, and I knew immediately that I had to celebrate it somehow. Big being such and important character to that game, this plot was brought to mind. But I knew that I couldn’t just make another Big episode and call it a day. That’s when the thought of Discord came to me. The moment I thought of it, I knew I had my episode, I knew that Discord would be an immensely fun character to explore. Eta came much later down the line. In fact, I wasn’t even certain that I was going to do Eta at all, until I started working on the assets for the Sprite Animation. But I knew I needed some kind of big, dramatic pull for the trailer, and a death match between not-Chaos and not-Gamma would totally do the trick. Moving on to a related topic, given that Gamma was a very important character to Adventure, while Chaos was more a force of nature than a character, it was supposed to come as a bit of a shock which of their two substitutes turned out to be the victor this time around. As I was writing Eta’s destruction, it occurred to me that it might have been interesting to keep it around as well, but it was really only there as someone for Discord to fight, and I didn’t have any plans that could justify doing otherwise. I suppose Eta can always be rebuilt, if it comes down to that. Heavy Magician is also of note here. Honestly, that entire end scene where Big meets Magician…I had no concrete plans for how that would go. I knew that no matter what I did, it would feel either awkwardly tagged onto the end of this episode, or onto the beginning of the next. The thought occurred to me while I was in the middle of it that I could’ve split this up into…not so much a two-parter as one episode directly continuing off of another, but honestly, after three months, I really just wanted to be done with that plot. And doing that would’ve required me to come up with something entirely new right on the spot to fill that second part. I mused over a few ideas, especially regarding what happened to Froggy after he jumped into Magician’s hat, but I decided against it. All of this lack of planning also means that Heavy Magician’s capture was a very last-minute decision. There was a small future scene I had in mind with Magician, but with this new decision came an entire future character arc revolving around that scene. That’s right. A character arc for Heavy Magician. And it’s gonna be a good one, too. So anyways, I winged that whole sequence, and I’m happy with it. So let’s see, what else is there to say? You might be…a little bit confused in regards to how you’re supposed to feel about Discord. He’s cute, and kind, and deadly, and quite possibly evil. That’s exactly the point. Everything about Discord is supposed to make you feel uneasy. You want to believe that he’s still just a harmless Chao, but there’s really no way to tell for sure. You might be having a similar confusion about Rouge at this point. Is she, or is she not, working against the Rebellion? It’s less clear than ever. No matter what the answer is, this episode was built to show that she’s still a good person. And as to that answer, you’ll just have to wait and see. Thunder, rain, and lightning. Danger, water rising. Clamor, sirens wailing. The newest episode of The Chaos Project looks like a bad sign. Can Eggman’s newest creation be trusted, by friend or foe alike? Or will it inevitably seek the world’s destruction? You can read this very special episode, right now, right here! On a side note, I really want to apologize. This entire website has been completely inactive since I published the sprite preview over a month ago. I wanted to get this episode out the very next week, but sometimes, life just gets in the way. Regardless, I think it’ll be worth the wait! -Until next time, open your heart, and it’s gonna be alright! That’s right, folks. It’s happening again. I’ve poured all my heart and soul into making another sprite animation, this one in the true style of a trailer for the epic event that’s coming. Please, take a look. So yeah. This was supposed to be the Sonic Adventure special that I’ve been teasing for far too long. So I started writing said special, and I got about a page and a half in, and then I realized, “the last three episodes in a row have all heavily featured Rouge, and this would be the fourth. I’m also wasting an opportunity to better lead up to this special, and call back to [the episode I’m now reviewing]. Given that the anniversary I’m trying to celebrate is 2 days from now, and there’s absolutely zero chance of getting this done by then, perhaps I should consider fitting another episode in between?” Yeah, that was well over a month ago. Regardless, one iteration of my storyboard for this season did have this episode coming before the special, and I only planned to accelerate the special because I thought I wasn’t going to meet the anniversary date, which happened anyways. So I ended up reverting back to that earlier plan, and Condition Extreme was born in its final form. Anyways, during the game’s development, there were at least a good 5 different stories written for it. Among those stories, there was one frequently recurring plot element (besides Sonic’s new girlfriend Tiara Boobowski): the DoomVirus. Now that should sound familiar. But it gets better. In these stories, the DoomVirus gets released, and infects Sonic, when the Master Emerald is shattered. I’m sure you see the connection, but I’ll get back to that topic later. Interestingly enough, plot elements relating to the DoomVirus were later repurposed for the Chaos character in Sonic Adventure, and even, to my utter shock, the Deadly Six from Sonic Lost World, nearly 20 years later! But I think that’s enough obscure trivia for now. On to this episode itself, finally. Fun fact. 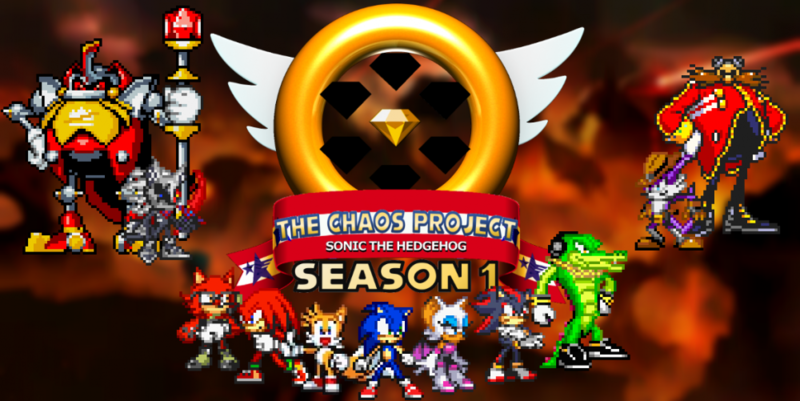 After deciding to make The Chaos Project a full-length, multi-season series, this was the second episode idea I ever came up with. Given that the first episode idea was shallow and uninteresting and I have no current plans to actually use it, that makes this episode the very earliest look at The Chaos Project anyone will ever have. And…that age probably shows. The original idea was really more of a general concept with two specific scenes attached. The idea was that Knuckles, due to leaving the Master Emerald shattered for too long, would lose his connection to it, and his powers as well. The two attached scenes were him fainting in the opening scene, and him jumping off the cliff to discover that he is unable to glide. The episode remained in that simple, unplanned state, up until about a year and a half ago, when I was doing some reading on the cancelled Sonic X-Treme. When I saw the original concept for the DoomVirus, I knew right then and there that I had my episode. I couldn’t pass up on the connection between the shattering Master Emerald and the incapacitation of characters as a result, and I was downright excited to reference and acknowledge that portion of Sonic history. Throw in the drama of the race for a cure and everyone else becoming infected, and I figured that would be enough to fill the necessary episode length. But that’s all this episode really ended up feeling like in the end. Filler. Given, that was technically the plan. At the time, the prospect of a multi-season project terrified me because I didn’t believe that I could come up with the requisite number of episodes. These days, I’m more worried about overstuffing my seasons and running out of space to fit in my funnest filler-ish ideas. And you know, it’s not like this episode is without its merits, as I’ve even had a reviewer like it especially. It’s our very first look into Knuckles’ personal history, something we’ve known absolutely nothing about up until now. And the chance to really dig into what happened to the Echidnas post-Perfect Chaos (Knuckles did all the necessary explaining on that point) satisfied what’s been bothering me for years. But one big question still remains. What was the “shadow” that allegedly spread the Doom Virus all those years ago? Anyways, my point is, this episode was necessary for a lot of reasons, but I feel like it just doesn’t stand up very well on its own. But that’s just my opinion. -But until then, remember to…keep an open heart! Or should it be “Condition X-Treme?” A new episode of The Chaos Project is out, celebrating the first first 3D Sonic game you never knew existed! Read it right here! Decades ago, the last of the Echidnas were wiped out by a mysterious illness. When Knuckles comes down with the very same disease, Sonic and the team must risk everything to save him. Great waves of change are coming. But what can stop the Doom Virus? No, it’s not the Sonic Adventure special yet. But it is leading up to it. I promise that’ll be coming very soon. But until then, please enjoy what comes before. A child’s eyes look down slowly from the blue sky above, to the mountain of a reddish hue that rises in front, to the base of the mountain at his feet, where an unmarked headstone is planted by a mound of recently-moved earth. The child does nothing, says nothing for quite some time. Finally, he looks to his gloved, spiked hand, which holds a familiar white flower. Then, he begins to speak. “We are both the last.” Slowly, he kneels down, and places the flower gently on the mound. “It shouldn’t have to be that way.” He remains there, kneeling on the ground in a somber silence. Knuckles turns sharply in the direction of the sound. “Huh!? Who said that?” The sound of his own voice prompts him to look down at his hands, no longer small like a child’s. Soon, he exits into an open area. 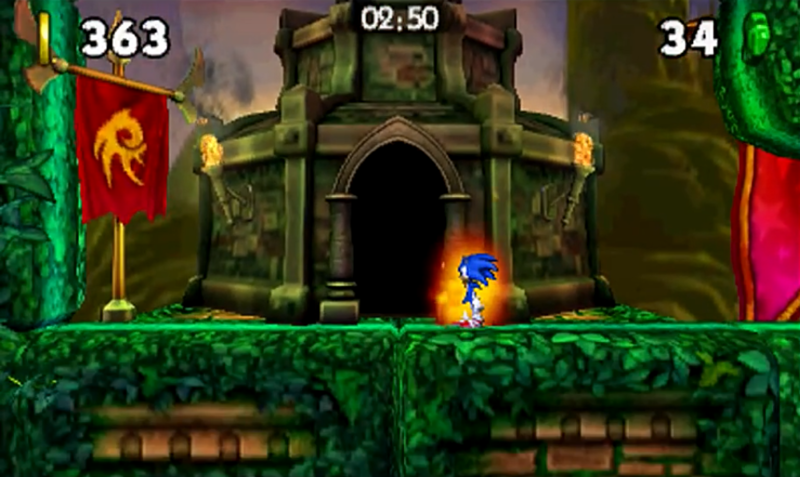 A bridge stretches out over a body of water towards an isolated landmass, where a crumbling stone shrine holds the Master Emerald at its top, in its whole form. The Emerald glows and pulsates brightly. “That shouldn’t be here…” He continues to run, across the bridge, and up the stone steps to the top of the shrine. As Tikal continues to fade, her words do as well. “… …Chaos… … …alone… … …you.” She disappears completely. Knuckles reaches out for her. “Wait! Come back!” He turns around. The Master Emerald, too, begins to fade away. “No!” He looks down, and takes a step back in surprise. The ruins beneath his feet, the island it sits on, the ocean far below, the sky all around, all of it begins to give way to empty blackness. One by one, everything around him disappears. In the empty void, he collapses to his knees, staring down into the darkness.